Outdoor games, musical activities, simple science experiments and much more windy fun! 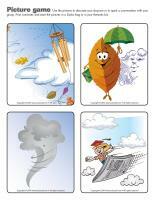 (Open thematic poster-Wind) Print, laminate, and decorate the walls of your daycare with all kinds of posters. (Open educa-decorate-Wind) Print, laminate, and cut out the various items. Use them to decorate your daycare and set the mood for the theme. 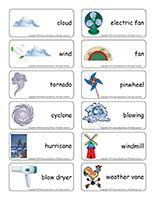 (Open word flashcards-Wind) Print and laminate the flashcards. Use them to spark a discussion about wind sources with your group. You may also encourage children to act out various situations where wind is present. Set a large fan in your circle time area and invite children to take turns standing in front of it to feel wind on their face. Help them inflate balloons and show them how they can slowly let the air out of the inflated balloons to feel wind on their face. (Open picture game-Wind) Use the pictures to decorate your daycare or to spark a conversation with your group. Print, laminate, and store the pictures in a Ziploc bag or in your thematic bin. 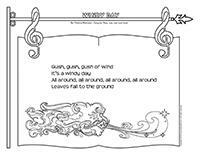 (Open activity sheets-Wind) Print and follow instructions. (Open educa-nuudles-Wind) Print for each child. Have children color the sheet. Once they are done, they may use Magic Nuudles to turn the coloring pages into three dimensional works of art. Variation: If you do not have Magic Nuudles, ask children to fill the spaces designed for the Magic Nuudles with bingo markers or stickers. 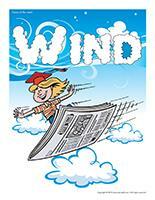 (Open writing activities-W like wind) Print for each child or laminate for use with a dry-erase marker. (Open stationery-Wind) Print. Use the stationery to communicate with parents, in your writing corner, or to identify your thematic bins. A container filled with a variety of figurines. Blocks of all kinds children can use to build a tent, a cottage, or an igloo to protect figurines from the wind. You can offer cotton batting to represent snow, a blue blanket to represent water, etc. Use cardboard, gray poster paint, paintbrushes, silver glitter, and cotton balls to make clouds. Use multicoloured cardboard and construction paper and a variety of pre-cut shapes to make umbrellas. Chalk and dark construction paper can be used to represent a winter scene or a snowstorm. Make sunglasses (they protect eyes from wind) out of empty toilet paper rolls and cellophane paper. Use recycled materials to make weather vanes. Add a small amount of water to poster paint to make it more liquid. Pour a few drops of paint on each child's paper and encourage them to blow through a drinking straw to spread the paint in every direction. Add a few drops of food coloring to bottles of white glue to create colourful glue. Use clear plastic document protectors, adhesive paper, or old CDs to create suncatchers. Simply let children decorate them as they wish and hang them in a window. Yellow, orange, and red construction paper to make a large sun as a group. Use construction paper and decorative accessories to make sun hats. Use empty paper towel rolls to make rain sticks. Encourage children to paint activities they can do on a windy day. Cut snowflakes out of coffee filters. Make kites or paper airplanes you can fly on a windy day. Coloring pages related to wind or meteorological conditions. Coloring pages related to the seasons. Stencils representing different weather-related pictograms. o	Rubber boots, a rain hat, a raincoat, a warm sweater, small mittens, nylon pants, an umbrella, etc. for spring or fall. o	A bathing suit, a beach towel, shorts, a t-shirt, sandals, a sun hat, a baseball cap, etc. for summer. o	A snowsuit, big mittens, a scarf, winter boots, etc. for winter. Set a microphone and a cardboard television in your role play area. Children will enjoy pretending to be a weatherperson. You may add a map of your province or state and meteorological pictograms for extra fun. Association game in which children must associate a variety of sports to the corresponding weather conditions. Puzzles related to the different seasons. Memory game involving illustrations that represent different meteorological phenomena. Mittens or mitten illustrations that children must place in order, from smallest to biggest. White and gray modeling dough children can use to create clouds. A variety of board games. Books about the weather and/or seasons. A CD with sounds of nature and headphones. Sun, raindrop, or cloud models that can be traced (or connect the dot activities). 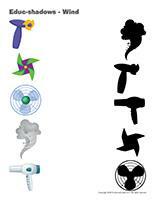 Weather pictograms that can be reproduced. Create an obstacle course and, at the end of it, trace the outline of each child on a large sheet of paper. Musical instruments that can be used to represent the sounds associated to wind, thunderstorms, a snowstorm, etc. Place an umbrella upside down and encourage children to toss balls of scrap paper inside. Blow bubbles and watch them float away. Add plastic containers with perforated bottoms to your water table and show children how they can represent rain. A container filled with snow or ice. Provide eyedroppers, basters, and colanders. Let children play with them at your water table. Make healthy popsicles with your group. Prepare cupcakes and let children decorate them with rainbow-coloured sprinkles. Place moist cotton balls and grass seeds in a Ziploc bag. Seal the bag and stick it on a sunny windowsill. Observe the changes that will occur in just a few days. Fill bags with a mixture of water and food coloring. Freeze them and let children explore the textures. Make your own weather wheel. Outdoors, make your own sundial. Simply plant a 6-ft pole in the ground and arrange twelve rocks around it. Arrange a variety of objects on a piece of black paper in a sunny location. What happens after a few hours? Discuss what plants need to grow with your group. A gardening activity involving plants set in different locations within your daycare can help children understand the importance of sunshine. Watch ice melt away in the sun. Use an electric fan to discuss wind force. (Open game-This is my spot-Wind) Print two copies of each illustration. Use adhesive paper to stick one copy of each illustration on the table. Place the second copy in a bag. Children take turns picking an illustration to determine where they must sit at the table. You may also use the illustrations to determine children's naptime spots or their place in the task train. As you move from one area of your daycare to another, practice whistling with your group. At first, children may not succeed, but their whistling skills will improve as the day progresses. 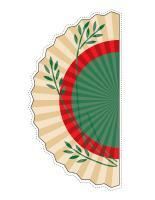 Fold a sheet of heavy paper accordion-style and gently use your handmade fan to create wind on each child's face. Blow soap bubbles and let little ones try to catch them. Notice their confused look when the bubbles pop. Use a blow dryer to make pieces of tissue paper fly through the air. Children must try to catch the pieces of paper before they fall to the ground. Of course, avoid letting children manipulate the blow dryer. Let a feather (or a sheet of paper) fall to the floor. Children must sit down before the feather touches the floor. The leader of the game chooses the weather. Prior to the activity, determine several different areas that can provide shelter during bad weather. At the start of the game, children simply walk around the daycare (it is sunny). After a few minutes, the leader of the game can announce a thunderstorm. Children must quickly run and hide. If, for example, it begins to rain, children can pretend to hold an umbrella as they are walking around. If the leader of the game says it is windy, they can pretend to have difficulty walking. Give each child a scarf. Alternate playing fast-paced music and calm, quiet music. Encourage children to move their scarf to the sound of the music. They can toss it in the air, twirl it around, etc. Children can also form a circle, holding their scarves. They can even trade scarves. Divide your group into teams of two children. Have children stand face to face with their partner. Give each team a marble or a ping-pong ball. Draw a line on the floor using colourful electrical tape. The first child from each team sets the marble or ball at one end of the line and blows on it, attempting to move it to the other end of the line where his/her partner is waiting to blow it back to him/her. Arrange a large quantity of feathers or other very light objects in a pile. Encourage children to mimic the wind to disperse the feathers or light objects all around the daycare. We are stuck in the wind! Give each child a light scarf or a party streamer. Have children hold one end of the scarf or streamer, letting it blow in the wind. If it is a very windy day, organize races. Have children let go of their scarf or streamer at the same time and watch to see which one will travel the farthest. Organize a badminton tournament in your yard. Help children notice how the birdie's trajectory changes according to the wind. The leader of the game stands in front of the group. The other children must follow the leader, turning in the same direction as him/her. When the leader of the game pivots to the right, the others do the same. If he/she pivots to the left, everyone spins towards the left. Inflate several balloons and tell children they mustn't touch the floor. However, tell them they must attempt to keep the balloons in the air by blowing on them. They aren't allowed to use their hands. Begin with one or two balloons. Add more balloons to slowly increase the level of difficulty. Play different types of music to encourage children to vary the intensity at which they blow on the balloons. 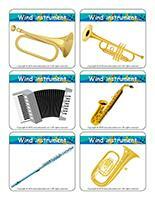 (Open wind instruments) Print the instrument illustrations. With your group, reproduce the sound that corresponds to each instrument. If you have some of these instruments on hand, explore them with children. Draw two lines on a table and deposit cotton balls on one line. Children must blow on the cotton balls until they reach the line at the other end of the table. This very simple activity will help children evacuate daily tension. It is therefore recommended before naptime or when your group seems particularly turbulent. Have children pretend they are flowers that are being rocked by the wind. At first, the wind is calm (they rock gently), but then, the wind suddenly blows much stronger and the flowers rock quickly from side to side (with their arms in the air). 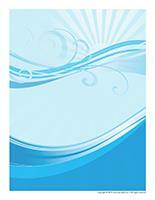 (Open educ-same and different-Wind) Print and laminate for durable, eco-friendly use. Chidlren must circle the illustration that is different in each row. (Open hunt and seek-Weather) Print and laminate. Children pick cards and must find the items in the scene. (Open educ-math-Wind) Print and laminate for durable, eco-friendly use. Children must count the objects in each rectangle and circle the corresponding number. (Open bingo-Weather) Print, laminate, and store in a pretty box. Play bingo with your group. (Open educ-shadows-Wind) Print and laminate for durable, eco-friendly use. Children must draw a line to the shadow which corresponds to each illustration using a dry-erase marker. (Open educ-ascending-descending-Wind) Encourage children to place each set of illustrations in order, from smallest to biggest. (Open snakes and ladders-Weather) Print and laminate. Use a die and figurines as playing pieces. 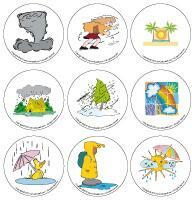 (Open story and memory game-Weather) Print, laminate, and cut out the illustrations. Place the cards face down on the floor. Children pick three illustrations and invent a story in relation to the items. To solidify the cards, you can stick them on the top of frozen juice cans. Ask around to see if a brother, sister, grandparent, parent, cousin, aunt or uncle plays a wind instrument. If so, invite the musician to visit your group to present his/her instrument and play a few notes. Each day, invite one child to talk about the day's weather as if he/she was presenting a weather report. With your group, watch a televised weather report to provide an example. On a windy day, have fun with bubble solution outdoors. Explain how it can be unnecessary to blow on the solution; the wind can do all the work. Let children experiment, varying their position, noticing the direction the wind is blowing, etc. Collect a variety of objects. 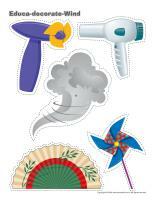 Using a blow dryer or an electric fan, try to make the objects fly. Which objects resist the force of the wind? Why? If you have a popcorn machine, use it to pop kernels in front of your group. Children love watching the process and hearing the kernels pop. Explain how the warm air is what transforms the kernels. Since eating popcorn is not recommended before 5 years of age, you may choose to use the popcorn for a craft such as a collage or necklace. (Open model-fan) Print for each child. Have children cut out the model and decorate it with a variety of materials. Help them fold their fan accordion-style. If you wish, add a popsicle stick that can be used to hold the fan. (Open craft-pinwheel) Print on colourful paper for each child. Help children assemble their pinwheel as per the instructions. They will enjoy making their pinwheel spin. (Open kite) Print the model and glue it on heavy cardboard. Cut it out and let children decorate their kite. You may try to fly the kites in your yard or simply hang them from the ceiling to decorate your daycare. 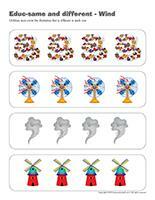 (Open meteorological mobile) Print, cut out, and let children draw on the various mobile parts. Make a tiny hole at the top of each shape and insert a piece of string. Hang the shapes from the figure eight to create a mobile. (Open cloud) Print for each child. 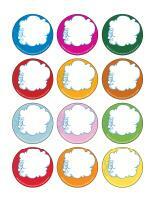 Have children fill the cloud shape with a variety of white items such as cotton balls, tissue paper, tissues, felt, etc. Give each child a drinking straw, blue poster paint, and a piece of waxed paper. Help them deposit a small drop of blue poster paint in the centre of the waxed paper. If you wish, you may add glitter. Using the drinking straw, children must blow on the paint to represent a gust of wind and spread the paint in every direction. Set aside to dry. Children love this painting technique. 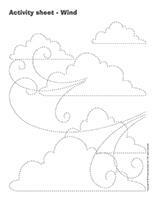 (Open coloring pages theme-Wind) Print for each child. (Open creative coloring-Wind) Print for each child. Have children draw items blowing in the wind.